The brothers Pacheco, Luis and Susano, often fought. One day Guicho hit Chano in the head with their father’s drum. He thanks the Child of Atocha he wasn’t beaten to death. The boy Artemio thanks the Child of Atocha for helping me to return hone safe and sound after being caught in the mountains by a horrible thunderstorm while he was herding his sheep. He gives thanks for the received favor. 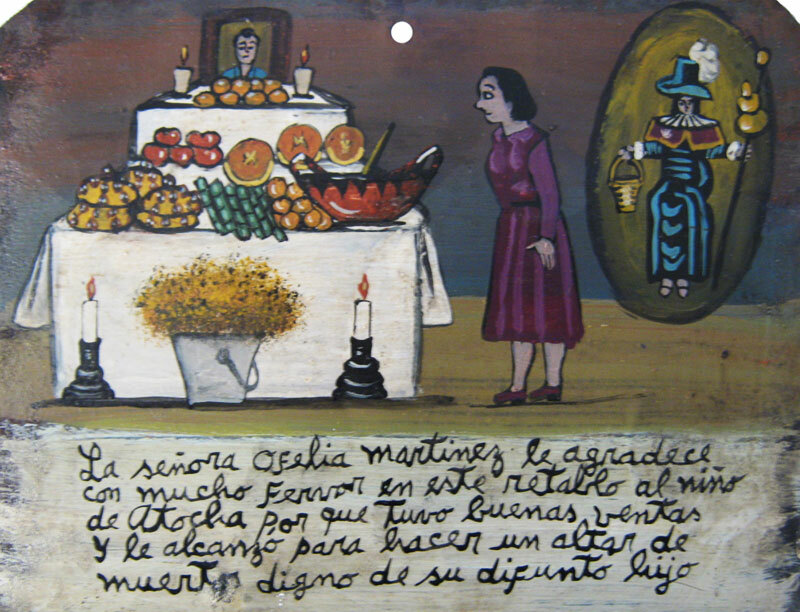 Ofelia Martinez thanks the Child of Atocha with this retablo for she made good sales and saved enough money for a beautiful altar in honor of her late son. 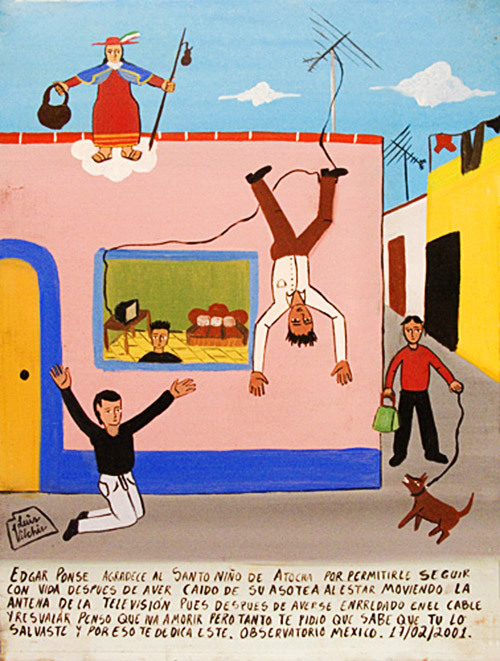 Edgar Ponce thanks the Holy Child of Atocha for surviving after felling down from the roof when he was fixing the tv-antenna. He got tangled in the cable, stumbled and fell down. He though he was going to die, he implored to you and knew you would save him. 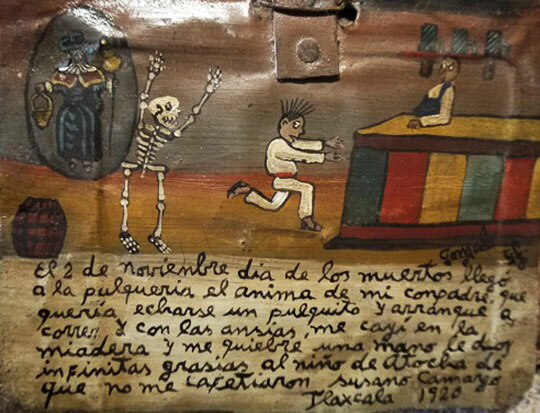 Edgar dedicates you this retablo. 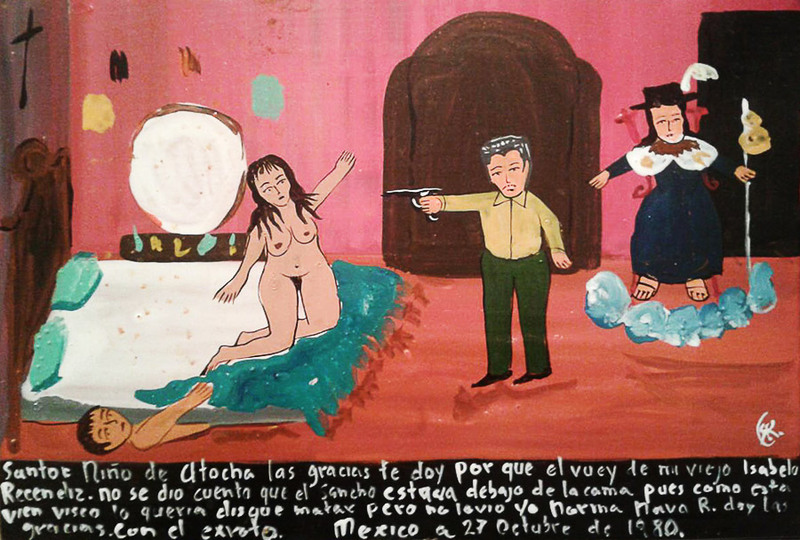 Thank you, The Holy Child of Atocha, because this cuckold my old man Isabelo Recendiz didn’t notice Sancho under the bed. He wanted to kill him but, because he is cross-eyed, he didn’t see him. 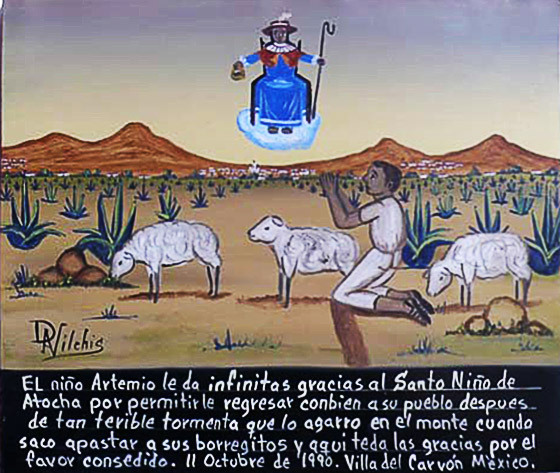 I, Norma Nava R., give thanks for it with this ex-voto. 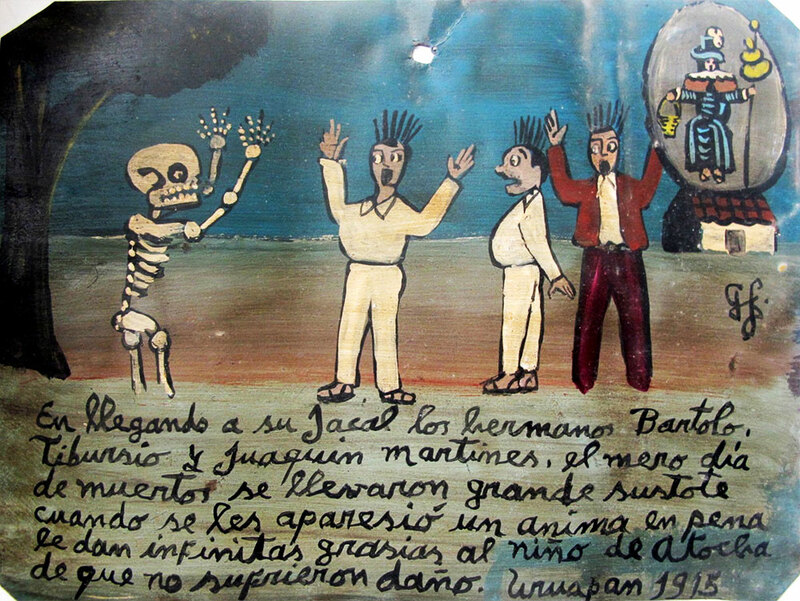 Day of the Dead, the Martinez brothers, Bartolo, Tiburcio and Joaquin, came home and got frightened because an unrested soul appeared to them. The brothers thank the Holy Child of Atocha for the short didn’t hurt them. 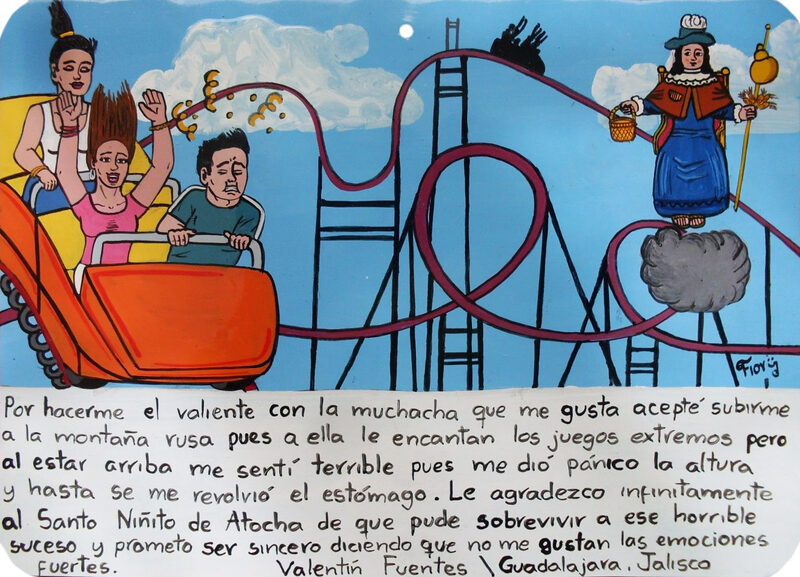 To show a girl I liked how brave I am, I agreed to do a rollercoaster ride. She loved extreme rides. And I, being at the top, felt terrible. I got a fear of hight and my stomach was upset. I infinitely thank the Holy Child of Atocha for getting through this horrible ride. I promise to be sincere and to tell that I don’t love strong sensations. 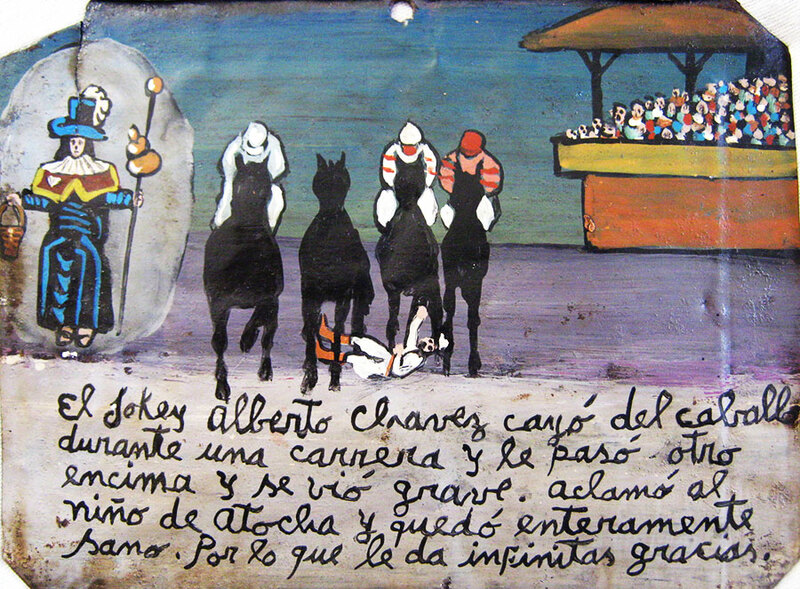 The jockey Alberto Chavez fell off his horse during a race, and another horse ran over him. He was in bad condition. He implored the Holy Child of Atocha and got completely recovered. He thanks for that. 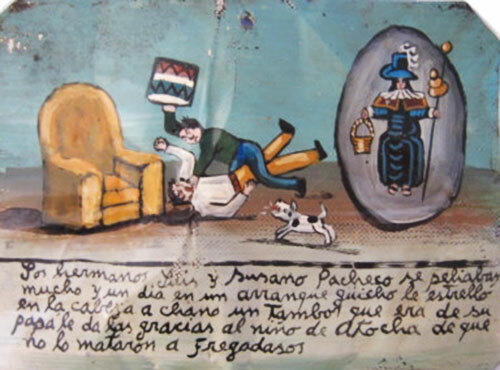 1920, San Jeremias, my buddy caught me with his wife on a mat. He started to shoot at us. I give infinite thanks to the Holy Child of Atocha who protected me so no bullet hit me. She took them all, and I escaped. May you be blessed, Holy Child of Atocha, for sending me Arturo. Since we met each other, I found happiness. Although I’m not a woman, he fell in love with me. And I just adore him because I fell in love with him from the first sight. I promised to offer a retablo if he agrees to be my partner. So some time after he asked me to move in with him. 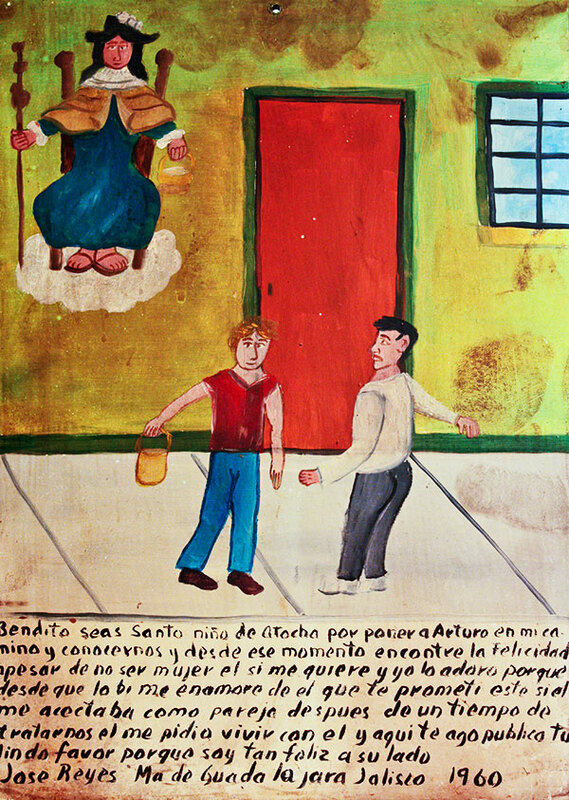 I make this retablo about this nice favor you made me because I’m very happy to be with Arturo. 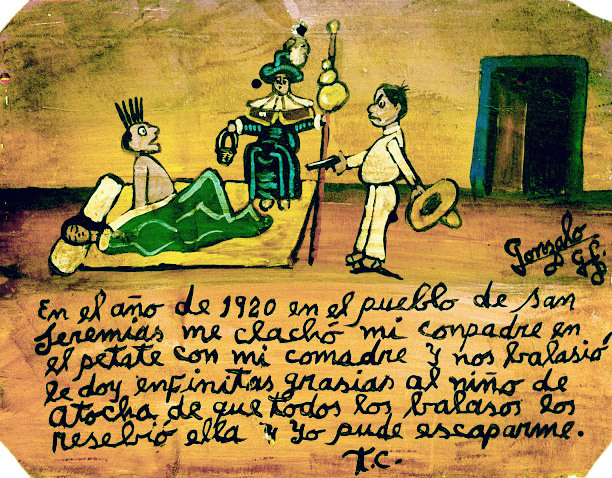 The night of August 15, 1930, I was coming back to Zacatecas. While crossing a river, I was dragged by the current from a saddle and carried away. I was afraid to die drowning and prayed the Holy Child of Atocha. My horse saved me and dragged me to the shore. 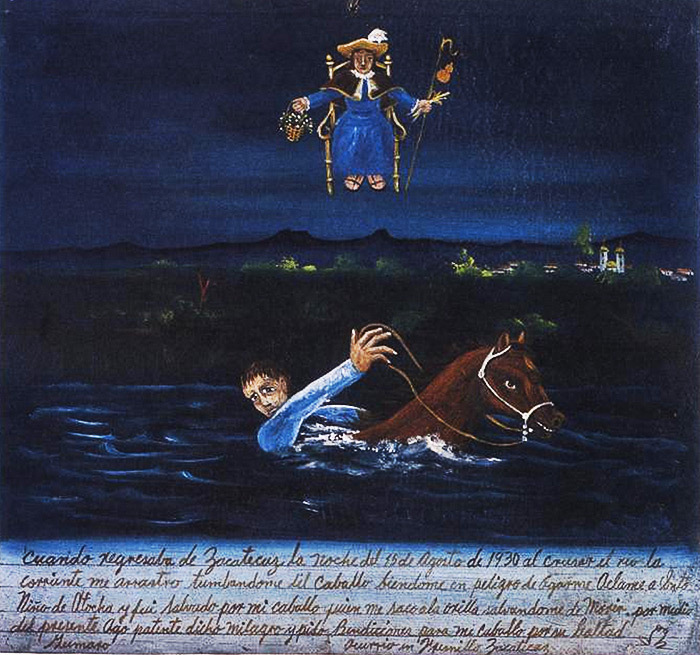 With this retablo, I testimony this miracle and ask to bless my horse for her loyalty. 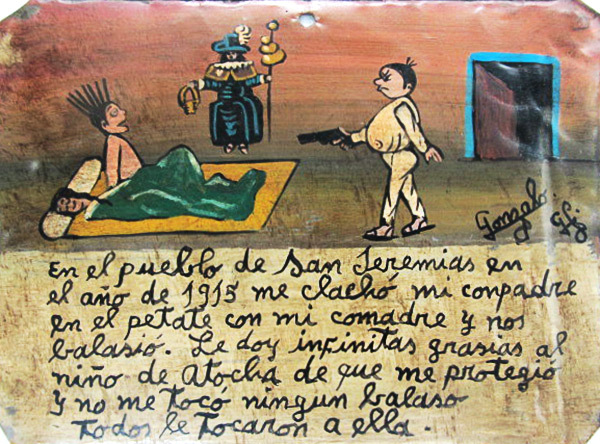 1915, San Jeremias, my buddy caught me with his wife on a mat. He started to shoot at us. I give infinite thanks to the Holy Child of Atocha who protected me so no bullet hit me. She took them all. November 2, Day of the Dead, my buddy’s ghost came to the bar and wanted to pass some shots with me. I got scared and wanted to run away, but he pushed me down and broke my hand. I thank the Holy Child of Atocha for I didn’t kick the bucket.